If you don't want to walk around all hunched shoulders and shuffle steps like an 80-year-old by the time you're 40, you need to make stretching a priority. Regular stretching can help maintain and improve range of motion and mobility, prevent injuries, and ease chronic pain -- particularly pain caused by muscle imbalances brought on by too much sitting. Plus, stretching just feels good. It's like a relaxing, energizing coffee break for your whole body. And while there are hundreds of stretches to choose from, if you're looking for accessible, safe stretches that target every major muscle group, you can't go wrong with the options on this list. Sometimes the oldies are still the goodies. This triceps stretch harkens back to elementary-school phys ed, and its effectiveness is still legit. Stand tall with good posture. Reach your left arm up into the air over your head, then bend your elbow, placing your left hand flat on your upper back, as flexibility allows. With your right hand, grasp your left arm, just above the elbow, and use your right hand to lightly pull your left elbow toward your head as your left hand reaches farther down your back. You should feel a stretch through your left triceps. When you feel a good stretch, hold for 20 to 30 seconds before switching sides. The biceps muscles actually cross two joints -- the shoulder and the elbow. In order to effectively stretch the biceps, you have to extend each of these joints. One good option is the standing biceps stretch, which is sometimes called the "chest opener," as it can also be used to stretch the chest and shoulders. Stand tall, feet shoulder-distance apart, knees slightly bent. With your arms extended, clasp your hands directly behind your back, palms touching. From this position, rotate your wrists backward, opening your still-clasped hands so your palms are facing the ground. Keeping your elbows straight, raise your arms behind your body until you feel a stretch through your biceps. Hold for 20 to 30 seconds, release, and repeat. To get a deeper stretch through your shoulders and chest, look up toward the ceiling and draw your shoulders backward to broaden your chest. Forearms kinda get the shaft when it comes to stretching and strengthening, but if you do a lot of typing, they probably deserve a good stretch. From a seated or standing position, extend both arms directly in front of your chest. Flex your left wrist toward you, so your fingers point upward, then rotate it to the outside until your fingers point toward the floor. Clasp your left palm with your right hand and lightly pull your left hand toward you until you feel a stretch through your left forearm. Hold for 10 seconds, then switch sides. Repeat two to three times per side. Given that your shoulders are involved in pretty much every upper-body movement you do, that means they're involved in pretty much every upper-body stretch you do, too. The nice thing about the cross-body shoulder stretch is that it targets the posterior side of your shoulder and into your upper back. Stand with your feet shoulder-width apart, knees slightly bent, both arms extended down at your sides. 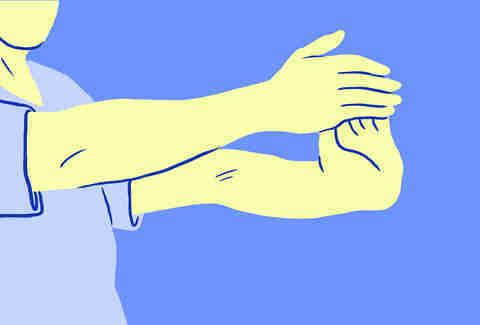 Keeping your left elbow straight, raise your left arm directly in front of your chest, then reach it across your body, toward your right shoulder. Bend your right elbow and clasp your left arm just below the elbow with your right hand. Use your right hand to gently press your left arm closer to your chest. When you feel a good stretch through your shoulder and into your triceps, hold the position for 20 to 30 seconds before switching sides. There are many, many muscle groups that span the length and breadth of your back. And because these muscles are involved in so many different movements at so many different joints, it's hard to choose just one stretch that does a good job at maintaining mobility and easing tension. That's why I've chosen a common yoga-based sequence that really does a good job of targeting your entire back, while also stretching the chest, shoulders, abs, and hips. Plus, the cat-cow exercise is known to help alleviate low-back pain, an all-too-common plague of modern life. Start on your hands and knees on an exercise mat, your palms positioned under your shoulders, your knees positioned under your hips, and your back and neck in a flat (neutral) position. Enter cow pose as you inhale by looking up and stretching your chest forward as you simultaneously press your hips upward, trying to articulate your tailbone toward the ceiling. This action will cause your low back to dip toward the floor, stretching your abs in the process. Hold for a count of three. Enter cat pose as you exhale by lowering your head between your shoulders and tucking your tailbone under, scooping your hips forward and pressing your upper back and shoulders toward the ceiling. Round your shoulders outward to broaden the stretch across your upper back. Use your abs to keep your hips scooped forward to feel a nice stretch through your low back and hips. Hold for a count of three. Return to a neutral, tabletop-like position on your next inhale, then as you exhale, enter child's pose by sitting back on your heels, your chest folding over your quads as you reach your arms as far as you can over your head, your palms flat on the ground. 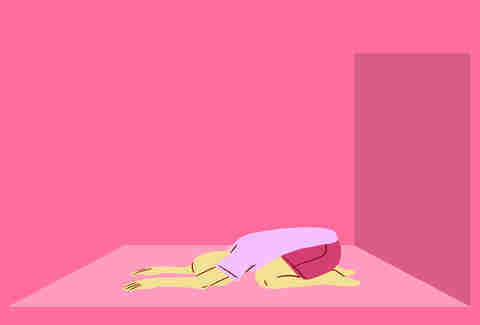 Hold this position for three deep breaths, really sinking your hips into your heels with each exhale. After three breaths, return to the tabletop position and perform three to five more rounds of the sequence. Some of the other exercises on this list have already helped stretch out the chest, but to really target each side of your body, you can't go wrong with the wall-assisted single-arm chest stretch. Stand with your left side perpendicular to a wall, about 1 to 2ft away from the wall. Reach your left arm behind you, your elbow extended, and place your left palm flat on the wall. Start with your hand positioned so your left arm is parallel to the floor. You should feel a stretch through your chest and the front of your shoulder. 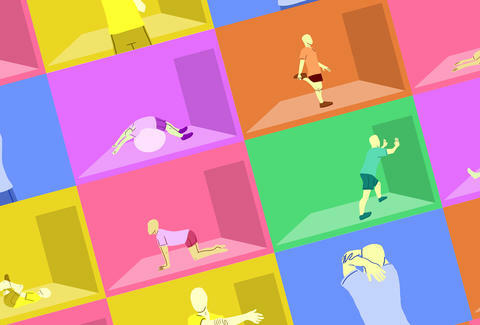 To deepen the stretch, shift your weight toward the wall, or slowly move your feet closer to the wall. When you feel a good stretch, hold the position for 20 to 30 seconds before switching sides. You can change the angle of the stretch by positioning your palm higher or lower on the wall. Backbends are an excellent way to stretch the entire front half of your body, from your chest and shoulders, down your core and into your hip flexors and quads. Unfortunately, most people over 25 have a hard time contorting their bodies like an Olympic gymnast. Enter: the stability ball. Just about anyone can enjoy a great ab, hip, chest, and shoulder stretch by performing a modified backbend using a stability ball for support. Sit on a stability ball, your feet planted shoulder-distance apart, your knees bent at 90-degree angles. Slowly step forward as you simultaneously lean back, lying down on top of the ball. With your knees still bent, extend your arms over your head and reach them backward, allowing your back to arch with the support of the ball. You should feel a good stretch through your abs, chest, and shoulders. Continue reaching backward as far as you can, and if you feel comfortable, step your feet forward, extending your knees to enjoy a stretch through your quads and hip flexors. Hold the supported backbend for 30 to 60 seconds, breathing deeply throughout. If you're active, particularly if you're a runner who overlooks cross-training, nothing feels as good as a deep glute stretch. The muscles of the glutes, particularly those involved in hip abduction -- the gluteus medius and minimus -- are prone to neglect. They're often not strengthened as much as some of the other muscles of the lower body, and they're prone to lengthening and weakening in individuals who do a lot of sitting (hello, desk job). These combined effects lead to all sorts of muscle imbalances through the glutes, low back, and hips, which a good glute stretch can help resolve. Lie on your back, your knees bent, feet flat on the floor. Cross your right ankle over your left knee, as if creating a "4" with your legs. Contract your abs to keep your low back in contact with the ground, then lift your left foot from the floor. Reach both arms forward to grasp the back of your left thigh. From this position, use your arms to pull your left leg closer to your body to deepen the stretch. Keep your right knee pointed toward the side of the room -- don't let it adduct toward your midline. If you're flexible enough, you can use your right elbow to press your right knee away. When you feel a deep stretch through your right glute, hold the position for 20 to 30 seconds before switching sides. You're probably familiar with the standing quad stretch, another phys-ed favorite. There's simply no reason to mess with a good thing. Stand tall, feet planted roughly hip-distance apart, knees slightly bent. Shift your weight to your left foot, bend your right knee behind you, and lift your right foot toward your same-side glute. Grasp the top of your right foot with your right hand to pull your right heel closer to your glute. Make sure your right knee is pointing toward the ground, your right leg still aligned with your left leg. When you feel a good stretch, hold the position for 20 to 30 seconds before switching legs. Your hip flexors, the muscles running along the front of your hips, are notorious for shortening and tightening when you spend all day sitting. (Again with the sitting!) If you have a desk job, it's particularly important to take time to loosen them up to help prevent the imbalances that can lead to back pain. Stand tall, your feet roughly hip-distance apart, your knees slightly bent. Take a wide step forward with your right foot, both feet solidly planted on the ground. Keeping your chest and torso tall, bend both knees slightly and sink your hips down an inch or two, as if entering a "baby lunge." From this position, tuck your hips under and press them forward until you feel a stretch through the front of your left hip. Hold for 20 to 30 seconds before switching sides. There are about a million stretches to choose between when stretching your hamstrings, but the strap-assisted stretch is one of the safer options because you're lying flat on your back, removing the sometimes troublesome forward fold. All you need to perform the stretch is some type of strap. You can use a yoga strap, a belt, a towel, or even a tie. Sit on a mat, your knees bent, feet flat on the floor. Position the middle of your strap under your right foot, then hold the ends of the strap in each hand. Lie back on the mat, then lift your right foot, pressing it against the strap. Extend your right leg fully. Draw your right leg up and toward your body, keeping your knee straight. Use your hands to pull the strap lightly and deepen the stretch. When you feel a good stretch, hold the position for 20 to 30 seconds before switching sides. Last, but certainly not least, is the much-required calf stretch. Your calves take a beating, what with carrying your full body weight around all day, so go ahead and give them a minute of love -- it's truly the least you can do to keep them happy and healthy. Stand facing a wall, your feet hip-distance apart. Press your palms into the wall at chest height, then lunge your right foot backward, planting your foot on the ground, bending your front knee as needed, but keeping your back knee straight. With your torso straight, lean forward into the wall, stretching the back of your right calf. When you feel a good stretch, hold for 20 to 30 seconds before switching sides. Laura Williams is an exercise physiologist and fitness writer who finally caved and started stretching regularly. You should too. Follow her on Twitter @girlsgonesporty.